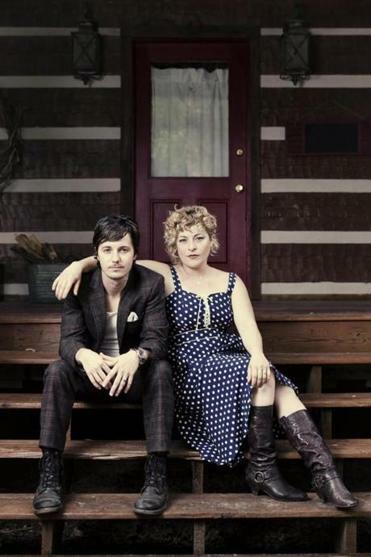 Shovels & Rope’s Michael Trent and Cary Ann Hearst. It’s a measure of the response the rough-hewn Americana music of Michael Trent and Cary Ann Hearst, who perform as Shovels & Rope, has garnered lately that just two years ago, they played here in a venue that holds 300 people. Last weekend, they needed two nights in one of the larger rooms in the area to meet the demand. During the second of those shows on Saturday, Trent and Hearst seemed a little awestruck by their success and how quickly it has come for their self-described family band. A gigantic “Shovels & Rope” banner in the style of a family crest hung behind their setup, and when they came out to start the show, it seemed to loom over them. The impression was quickly dispelled; as soon as they began to play, they seemed as big as the banner. The husband-and-wife pair regard themselves as a band rather than a duo, and they have a determined DIY commitment and an all-hands-on-deck approach. That aesthetic is most fully manifested in concert. On record, they sometimes supplement their own playing with instrumental assistance from others. But live, it’s Trent and Hearst and nobody else, and every instrument is shared. One song finds Hearst flailing away on the acoustic guitar and Trent pounding on their spartan drum kit (and, in all likelihood, devoting one hand to playing a portable keyboard; at one point Saturday, he was simultaneously playing mouth harp as well). The next song, they’ll have traded places, all the while singing, wailing, murmuring, and especially harmonizing, often into the same microphone. Saturday, their swapping and singing was mosty devoted to their fine new album, “Swimmin’ Time”; they ranged through almost all of it. One of its songs, “Save the World,” found them both playing guitar facing each other, then singing into a shared mike. As big a joyful racket as they make, a Shovels & Rope performance also reveals an intimacy between Trent and Hearst that seems just as joyful. When they were singing “Save the World,” it was as if these partners were playing to and for each other, not to a room full of hundreds of people. John Fullbright opened with a set of his literate, intense singer-songwriter fare, finishing up with a version of “Ain’t Nobody’s Business” that breathed exhilarating life into the old blues standard. Stuart Munro can be reached at sj.munro@verizon.net.